We've seen a grainy shot of the iPhone 6s box before, confirming a 16 GB model will be the start this year as well as the years before it. Somewhat disappointing, but it's Apple, after all, and that should be expected - any eventual basic storage bump won't be coming before the iPhone 7, it seems. Today a clearer shot of the possible iPhone 6s box has appeared, in English this time, confirming the name, and the base 16 GB storage version as well. We can also see that the handset will support all 3G and LTE frequency standards, including the ones that Chinese telcos use (surprise, surprise), indicating that a Qualcomm modem will be inside again. In a somewhat more exciting boxing leak, the wrapper meant for its rumored rose gold version has emerged, too. 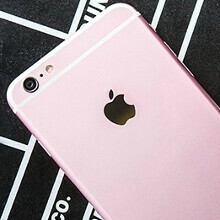 This color is the one everybody is waiting on, and, if the box turns out legit, the front of the phone would be white, while the rear will be in rose/copper gold hue, which should be a sight to behold, and a few Chinese makers already copied this color in their newest gear, just in case it proves a popular option. Interestingly enough, the iPhone on this box has the same colorful wallpaper drawing we saw leaked before, hinting at the rumored animated wallpapers Apple might introduce with the new iPhones. We will be relaying the iPhone 6s event for you tomorrow, so stay tuned for all the rosy details. apple did it again! What a revolutionary move from Apple!!! 1/16 of the sales too. Get over it dude, people want what they want. That's why iPhones sell like they do. Apple is the current leader in brainwashing. When Apple comes out with a new product, such as their new watch, I don’t feel as if I have a choice about buying it. They are making me do it. I will rationalize it by saying it is for market research, or something. But as a trained hypnotist, I recognize that I do not have a choice in the matter as long as I still have money. Apple did that to me. I have no rational need for their watch, and yet I will definitely buy one. 16GB? Are they for real? No "flagship" phone should have 16GB nowadays, 32GB should be the minimum. Simply pathetic for the big money they charge for it. Atleast most of us already know why you are here.... just to generate more traffic..
Why is it that so many iPhone users are so classist? What exactly under Android are you comparing the iPhone too? The iPhone isnt even on the same caliper as the S and Note. Even the Xperia is somewhat better. The G4 is better too. Yes it is better than some crappy low end Android device. So?! There are more than low class crappy Android phones. The iPhon eisnt even better than some of the mid-ranged Android offerings. Would you liek me to show you some? Its dumb to even put iPhone in the same low class category of some off-brand low class Android device. So basially you started off with ignorance in showing you have no idea what you're talking about. Would you speak of a Ferrari F40 in the same sentence as a Volkswagen Beatle? Because that is what you just did. Ignoramus. You are 100% right. "No flagship phone". Apple doesn't make a flagship phone. They make one phone. In order to have a flagship, you much make other phones within the same brand to compare it too. Since Apple has a device that actually has hardware that exceeds the hardware specs of the iPhone, it's hardly a flagship. They make one iPad, they make one iPhone. By definition the iPod Touch would be the flagship model of the iPod family. 16 GB is ideal for low-end 200$ phone . I actually love the color on the box. Too feminine for my taste but at least they won't tarnish their reputation with that pink hue floating around. It's tacky compared to the other colors. They can eliminate the yellow gold and just keep the rose gold. Continuous different separate articles based on colours, storages, price, availability, size, resolution etc. PA you do favor Apple a lot, don't you? I mean, who wouldn't? Do you know any company on this planet that sells more, has more hype, people are interested more into than Apple? Of course they will post any leak, any rumour they find as it sells. It gets them clicks and ad revenue. Why would a generic tech site ignore the biggest most wanted company on the planet? I don't think 99% of the world would care for anything that HTC is doing as an example. Plus as you know very well prior to any apple presentation ALL sites flood the internet with articles. "Sheeps" That grammar, it's terrible. The plural of Sheep, is Sheep. What exactly is a Sheeps? You are one. Apple owners are. You are classed as one of them. Sheep is already plural. So the word would be iSheep. They could have at least bumped up the minimum to 32 GB instead of using the obviously manipulative tactic of keeping 16 and having the next storage size be 64 so that people who fear running out of storage with such little internal memory shell out the extra dough for the 64 GB version or higher. Not good for us consumers at all, Apple. You still have some catching up to do, despite everything. If they'll have 32gb most people would've no reason to upgrade to the higher storages. Thus less margins for apple. I really don't understand why people get excited about a name. Pink color is pink, even Apple would name it Roses Gold. Go get a life, iSheep.